Painkillers can be deadly. You should know the risks. The chiropractors at Canberra Spine Centre are extremely concerned about the ever-increasing rate of adverse effects that common, over-the-counter painkillers are producing in our population. Knowing the risks of adverse drug reactions (ADRs) is the first step to ensure that you and your loved ones are not at risk. Physical pain is a problem that everyone faces in life. In the modern world, in many aspects of our lives, we are often sold quick fixes that not only fail to deal adequately with the problem, but create new ones. Think of diet pills for overweight, finance for big-screen TVs, or putting people in jail for minor crimes. In the world of health care, the most obvious example is the use of painkillers. It is clear that pain relieving medication eases suffering and is sometimes the only solution. But we are all too often led to believe that medication is the only answer or best option for coping with physical pain. However, the professionals at Canberra Spine Centre want you to realise that pain is a symptom of physical problems that should not be ignored. Pain is a message from your body telling you that something is wrong. It is vitally important for all of us to deal with the causes of pain. While pain medication can be necessary for some people just to get by, for many, taking painkillers masks the pain that is actually useful for them. When they can ignore the pain, this allows that person to continue doing the things that caused the problem in the first place. What are ADR’s? According to the World Health Organization (WHO), an ADR is “a response to a drug which is noxious and unintended, and which occurs at doses normally used” (Technical Report No. 498 1972). For example, if someone takes a pain killer to relieve joint pain, but unintentionally develops a stomach ulcer or liver damage, that is considered an adverse drug reaction (ADR). ADRs are side effects that result from taking any kind of medication. They can range from allergic reactions such as respiratory arrest, rashes, headaches, dizziness, and nausea, to organ damage in important places like the liver, stomach, and kidneys. The most powerful painkillers are highly regulated and require a medical doctor’s prescription to obtain. These include pain medicine derived from the opiate family and steroidal anti-inflammatory drugs. They can have serious side effects and can also be addictive. What is alarming to holistic healthcare providers is the rise in the use, and therefore, the abuse of nonsteroidal anti-inflammatory drugs (NSAIDS). 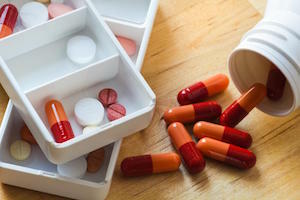 These include pills that are readily accessible by anyone, easy to find, and whose side effects are often overlooked because the public often assumes that these drugs are safe, simply because they require no prescription to obtain. NSAIDs include such common, household items as ibuprofen, aspirin, naproxen, and acetaminophen (also known as paracetamol). You probably know these drugs by their brand names, as they are common in almost every household’s medicine cabinet. They can be very useful as temporary aids for pain management. Making life bearable for the short duration of an acute pain episode not only makes life easier, but the pain relief can also be beneficial in preventing the development of chronic pain. The problem arises when we forget that these NSAIDs are powerful, systemic drugs that all have side effects and will damage our bodies when not used as intended. Using these drugs over extended periods or on a regular basis is where the damage can occur. Many people choose to treat their pain with these seemingly innocuous drugs rather than deal with the causes of their pain in a holistic and healthy way. That is why at Canberra Spine Centre, the chiropractors want you to be informed of the dangers and risks of prolonged NSAID usage and the real possibility of overdose. Hospitals around the world have reported alarming increases in painkiller overdoses in recent years (Eur J Intern Med 2008;19:505-10). The causes of this rise are the increased acceptance of over-the-counter painkillers as a common practice for pain management, increased accessibility to this class of drugs, increased marketing of painkillers to an uninformed public, and inattention by the public as to proper usage of these drugs. Children and the elderly are the most susceptible to NSAID overdose, as their physiology is not the same as the average adult consumer for whom these medicines are designed, and thus the medicines are not metabolised in the same way. Parents are all too often unaware that giving children a common painkiller can have side effects and risks of ADRs far more dangerous than for adults. Giving children NSAIDs can inadvertently teach children that taking these drugs is the normal way to deal with pain. This can lead to children self-administering these drugs. Overdosing by taking too many pills becomes a serious risk for children who know where the medicines are kept and may think of these pills as candy. The ways in which our bodies absorb and respond to drugs changes with advanced age. The elderly may get into the habit of treating chronic pain with what they think are harmless painkillers, not realizing that the prolonged intake and possibly high doses that they are taking can lead to serious organ damage. The elderly are often on multiple medications to treat other health problems. Taking NSAIDs can have unexpected ADRs that can be life threatening or do severe damage because of cross-medication interference and reactions. Everyone who is taking one or more medications should consult a physician before taking NSAIDs for pain. At the very least, they should read the literature that comes with the medicine for any negative indicators regarding the dangers of taking an over-the-counter pain medicine. Your chiropractors at Canberra Spine Centre are very concerned with your overall health and quality of life. They specialize in keeping the spine well-adjusted and healthy. The spine houses the central nervous system, the body’s internal communication system. The nervous system controls and coordinates every cell and organ in the body. It also conveys pain messages to help alert you to the consequences of behaviours that are causing damage. A healthy, well-functioning spine and nervous system cord is a huge contributor to a happy, healthy life. Any vertebral subluxations (loss of normal motion and alignment between spinal segments) can cause serious problems in the nervous system’s ability to convey messages. These subluxations can cause local damage (and thus pain), but due to its far-reaching control, can also be the source of damage and pain that could be felt anywhere in the body. Chiropractors specialize in treating the spine through delicate spinal adjustments to ensure proper motion and alignment so that the nervous system can function at its best. Dealing with the causes of pain, rather than simply masking health problems, is central to the philosophy of chiropractors like the professionals at Canberra Spine Centre. Consumption of NSAIDs to manage pain should be a temporary and carefully administered option used minimally until the causes of the pain can be dealt with in a safe and sustainable, holistic fashion. Call today (02 6257 9400) to receive our special offer ($280 value for only $75) for a thorough examination and a consultation. Let Canberra Spine Centre help you with any pain issues you might be experiencing. We can also advise you on pain treatment for children and the elderly. Come see us today and let us help you to experience the healthiest and most pain free life possible.